Understand how the 2016 edition of NFPA 20: Installation of Stationary Pumps for Fire Protection applies to the design, installation, and commissioning of fire pumps. 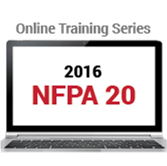 This online training series is the ideal starting point for improving your knowledge about the 2016 edition of NFPA 20: Installation of Stationary Pumps for Fire Protection. The new NFPA 20 has been updated to include requirements for today’s latest industry changes and new technology -- including clarified criteria for fire pumps arranged in series, and first-time requirements for multistage multiport pumps. Work at your own pace through interactive courses that begin with a high-level overview of this important NFPA® Standard and the basics such as various types of fire pumps and their expected performance characteristics. Then you will move into more detailed information about pump design, installation, and commissioning requirements. Two courses are included in the series. Define critical terms and design considerations such as "balanced flow" and "unbalanced flow"
Complete this two-hour online training series and qualify for 0.2 CEUs. Completion of each individual one-hour course qualifies you for 0.1 CEU. Upon successful completion of a course or the course series, participants will be prompted to download the CEU certificate directly from the course site. Learn the basics about stationary fire pumps and NFPA 20 provisions -- without leaving your desk! Stationary Pumps for Fire Protection, NFPA®'s updated self-paced online course, provides participants with a high-level overview of the purpose of a fire pump, the types of fire pumps available -- including added coverage of multistage multiport pumps, and fire pump performance characteristics. Based on the 2016 edition of NFPA 20: Installation of Stationary Pumps for Fire Protection, the course also examines fire pump drivers and controllers, along with parameters for selecting the best driver to meet the needs of a given situation. Define "normal power" and "reliable power"
Design and Installation of Fire Pumps provides an essential introduction to the 2016 edition of NFPA 20. NFPA®'s Design and Installation of Fire Pumps online training course reviews the basic installation requirements for centrifugal fire pumps -- including those related to pump enclosures, suction and discharge piping, and peripheral equipment and appurtenances. Work at your own pace to learn about key provisions in the 2016 edition of NFPA 20: Installation of Stationary Pumps for Fire Protection, and examine the most critical elements of the new (or repaired) fire pump commissioning process including acceptance testing. Define "balanced flow" and "unbalanced flow"
Define "laminar flow" and "turbulent flow"